Born in Brandon, MB Ron Hextall played his junior hockey from 1981 to 1984 with his hometown Brandon Wheat Kings of the Western Hockey League. He was drafted in 1982 by Philadelphia and in 1985 played with the American Hockey League Hershey Bears. In 1986, he was named to the First All-Star Team and acknowledged as the AHL's top rookie. 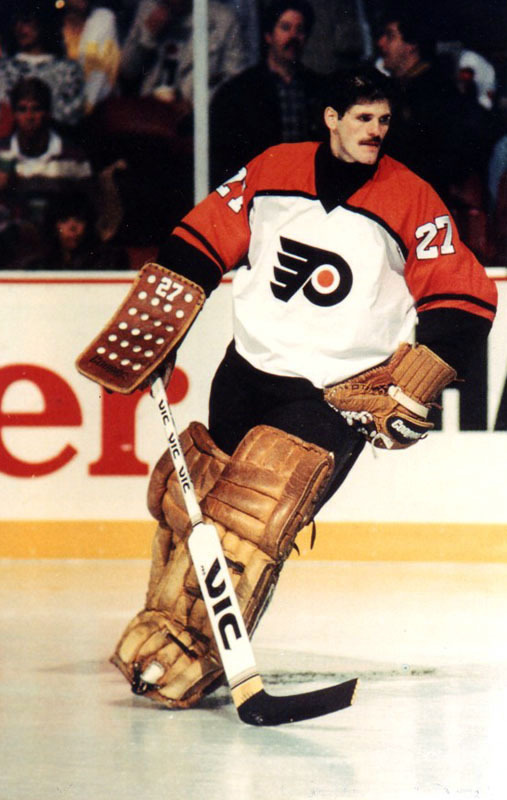 He moved up to the Philadelphia Flyers in 1986-87 and led the Flyers to the Stanley Cup finals winning the Vezina and Conn Smythe trophies along with selection to the National Hockey League's First All-Star Team. He was the first goalie in NHL history to score (by shooting the puck) both a regular season goal and a play-off goal. His aggressive style of play saw him record more than 100 penalty minutes in each of his first three seasons, and establish new records for the number of penalty minutes recorded by a goaltender in the NHL. Ron Hextall had a 13-year NHL career which included the Quebec Nordiques, and New York Islanders, 608 games, 296 wins, 214 losses, 69 ties, 23 shutouts and a 2.97 goals against average.